A 500-foot-wide channel crosses the east end of Sand Island: This is Hawaii’s lifeline. 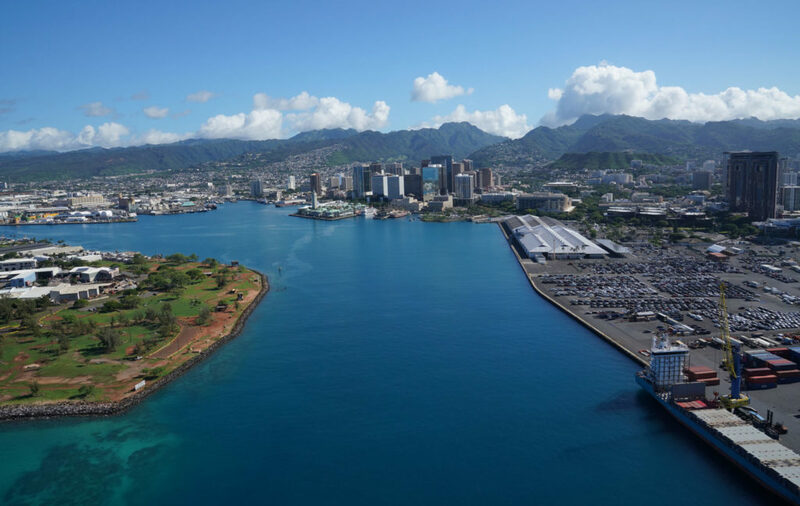 It’s the passage into Honolulu Harbor, where every day stevedores busily unload most of the food, supplies and cargo that keep the state’s approximately 1.4 million residents and its thousands of visitors alive and thriving. From this narrow harbor — and a single bridge leaving Sand Island — supplies fan out. They move across coastal highways, inland roads and interisland barges, replenishing the entire state. The harbor is Hawaii’s most important resupply point. It would also be the worst point of failure in a storm, tsunami or other disaster. 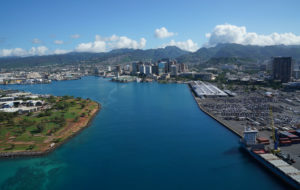 An aerial view of the 500-foot-wide channel into Honolulu Harbor, where most of the state’s food and goods are delivered. “Any island, that’s the critical piece in a natural disaster is the entry point,” says Chris Martin, Young Brothers’ terminal operations director. No other harbor in the state has anywhere near the same capacity to unload cargo. State emergency planners estimate 3,000 tons of food pass through there each day to keep the islands’ shelves stocked. And if Honolulu Harbor closes, the state starts to rapidly burn through food and supplies. The islands have about five to seven days of food on hand at any given time — that’s what the Hawaii Emergency Management Agency found after surveying multiple grocers and distributors. There’s no long-term storage in this “just-in-time” economy. The U.S. mainland is 2,500 miles away. From the West Coast it takes from five to eight days for cargo ships to reach this populous island archipelago, one of the most remote places on the planet to live. State emergency planners estimate 3,000 tons of food pass through Honolulu Harbor each day. There are protocols to help safeguard the harbor against a storm. Still, it could fail in a number of ways. Large shipping containers and other debris, whipped away by winds, could block the channel. Ships that don’t depart could damage piers, overturn or sink — also blocking entry. There’s no large-scale salvage or dredging equipment. If anything large blocks the harbor, it would take at least seven to 10 days just to get that equipment on-island, emergency officials say. When a cyclone approaches, Hawaii’s shipping companies send their fleets outside of the harbor, where they’re out of harm’s way and can’t damage the port. “If you sit at Wilhelmina Rise, you’ll see a bunch of boats just headed out to sea” the day before a major storm arrives, says Martin. Indeed, as Lane neared Honolulu in August, Young Brothers’ eight-barge fleet fled north of the Hawaiian Islands, carrying its forklifts, generators and other equipment out to sea to dodge the storm. 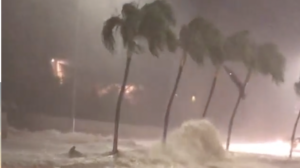 Had the storm hit Honolulu, the company would then have most of its equipment ready to help with the aftermath. 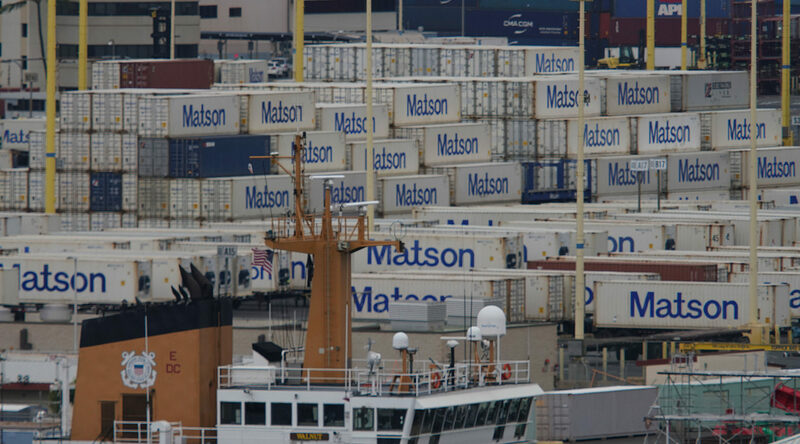 But Matson and Pasha, which handle larger cargo volumes from the mainland, can’t pack up the 10 massive gantry cranes they collectively own along Piers 51 and 52 at the water’s edge. Those cranes run along a rail track and extend nearly 300 feet in the air. Questions remain about how they would fare. Experts and engineers who’ve surveyed the harbor say they’re mostly worried storm surge would swamp the cranes’ electrical components and render them inoperable, stalling much-needed cargo shipments. When Katrina hit the Gulf Coast as a Category 3 hurricane in 2005, it caused $100 million in damage to Mississippi’s three coastal ports. Their docks and piers, electrical systems, rail tracks and a gantry crane all sustained severe damage. Matson says its massive cranes will be able to withstand 145 mph winds after a $60 million upgrade scheduled for 2019. Four months after the storm, those crippled Mississippi ports operated at just 31 percent of their capacity. 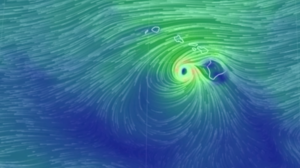 Hawaii’s emergency planners consider it a warning of what might happen here. 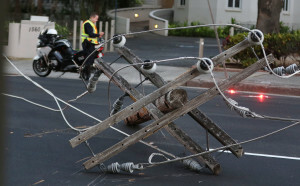 In Honolulu, Pasha’s cranes and the metal “tie-down” straps used to lock them to the ground are nearly 50 years old. They’re inspected every few years and built to withstand hurricane winds, their owners say. 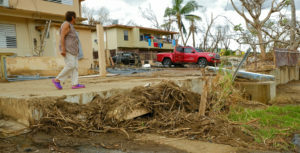 The structures have already withstood Iwa and Iniki, two hurricanes that skirted Oahu in decades past. But they’ve never been tested by a direct hit. 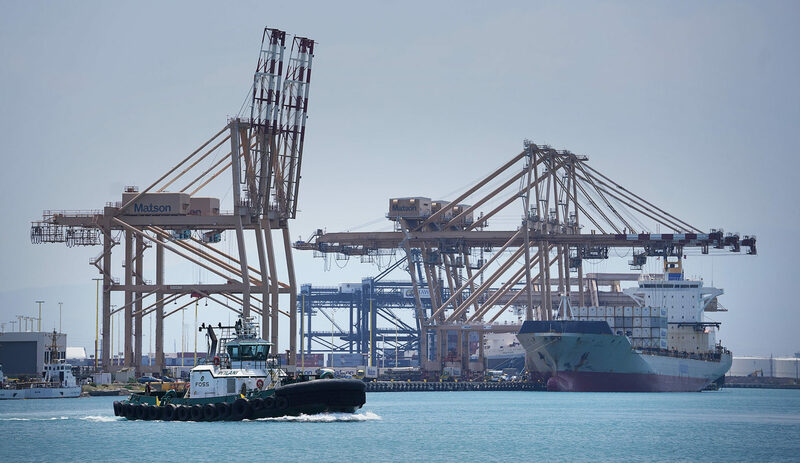 “It’s really hard to say, right?” says Michael Caswell, senior vice president for the Hawaii Stevedores Inc., a subsidiary of Pasha that owns the cranes, of how the cranes would fare in such a scenario. Matson, meanwhile, says its cranes are built to withstand gusts of 130 mph and, after a $60 million upgrade next year, they’ll be able to withstand 145 mph gusts. The company doesn’t use tie-downs for its seven cranes. The bigger concern in heavy winds, Caswell says, is to prevent a runaway crane from sliding sideways down the rail track. As Lane and Olivia approached, Hawaii Stevedores lashed the cranes together at one end of the pier, secured them with tie-downs, and placed a weighted shipping container across their railway path — just in case one was to get loose. Matson takes similar steps. The two companies’ cranes run along the same rail track, but they don’t coordinate directly when a storm is oncoming. The Hawaii Department of Transportation does not keep inspection reports on the cranes. 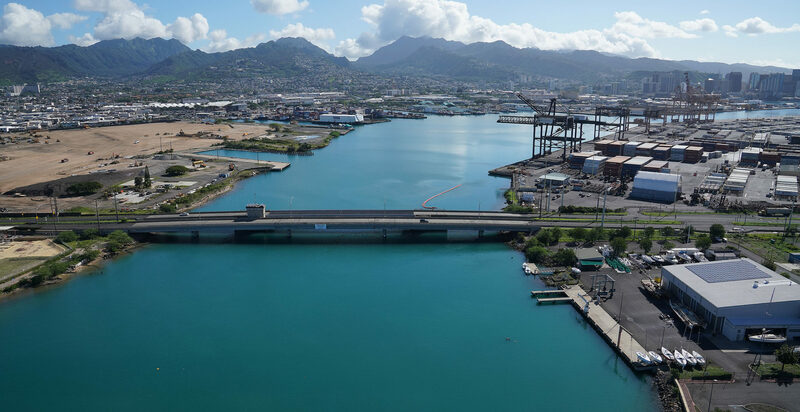 This narrow Sand Island Bridge is the harbor’s sole connection to mainland Oahu. Trucks haul goods across the bridge to all points on the island. In the coming years, Pasha plans to move to a new terminal right across the water, which will have five new cranes. Matson will then take over Pasha’s existing space on Pier 51, and Pasha’s aging cranes there will be removed. Besides the cranes, there’s questions about how the piers they rest on would fare. A 2015 University of Hawaii study found the Matson and Pasha piers wouldn’t be damaged during a hurricane or tsunami. 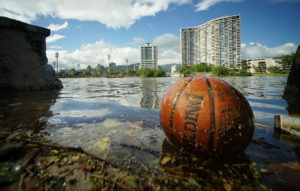 But a subsequent 2017 study for the state found that 3 feet of storm surge could knock out half of Oahu’s pre-World War II-era shipping piers, rendering much of the port useless. The author of that study, Gary Chock, of the Honolulu-based engineering research firm Martin & Chock, did not respond to several requests for comment. Should the harbor fail, there’s a Plan B of sorts: the more sheltered Pearl Harbor. Pearl doesn’t have gantry cranes, but the Navy does maintain a mobile stick crane there for emergencies. In 2015, the Navy, Coast Guard, state officials, Young Brothers and others tested whether they could offload at least some cargo there. But that lone, yellow crane can only handle a fraction of the volume. Where the gantry cranes at Honolulu can offload 42 containers an hour, the crane at Pearl can offload six to eight. In a disaster, only the most critical supplies would come through Pearl. “The TV that you’re waiting on from Amazon is not going to be a high priority,” Mullins mused. HI-EMA has ideas to help take some of the strain off the port in an emergency, but it’s slow going. For instance, the state could partner with large box retailers, such as Costco and Walmart, to add warehouse space for water and other emergency supplies. 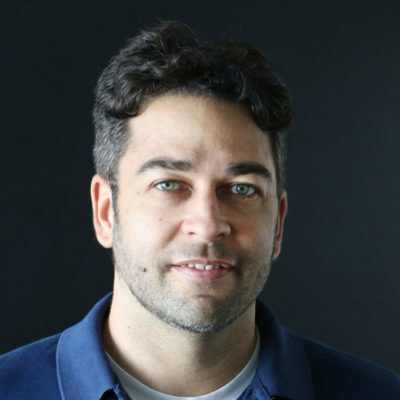 The retailers would benefit from more sales, and the added inventory could take some of the strain off FEMA, which typically supplies millions of liters of water after a disaster, explained David Lopez, HI-EMA’s critical systems planner. “We’ve got them on board,” Lopez said of retailers, but the concept still lacks full buy-in from state agencies and leaders. “We need to pick up the ball and run with it,” Lopez added. Oahu residents are encouraged to store two weeks of food and supplies, but that’s a challenge with the island’s astronomical cost of living and limited space. 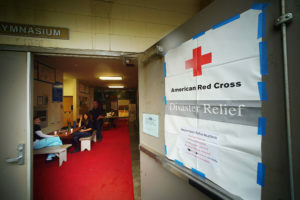 Lopez suggested that state leaders consider offering tax breaks to residents who buy special disaster food kits that take up minimal space. Still, he acknowledged, such a program would be tough to implement in Hawaii, which already faces numerous other demands on a limited budget.